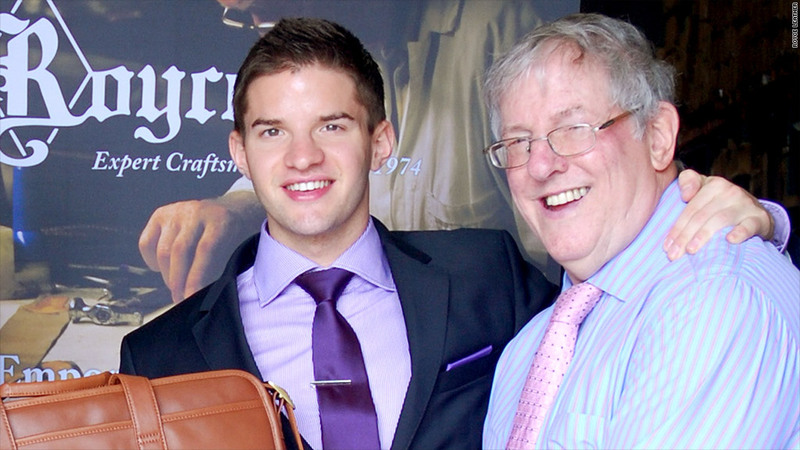 Billy Bauer with his father, Harold Bauer, founder of Royce Leather. For immigrant-owned small businesses in the U.S., ties to their home countries can be very lucrative. Firsthand knowledge of the culture as well as connections abroad make immigrant entrepreneurs well-positioned to navigate the complicated export landscape. That's true for Royce Leather, a family-owned leather business in Secaucus, N.J.
Harold Bauer founded Royce Leather in 1974, just one year after moving to the U.S. from Austria. Today, 65% of his business comes from exporting to 15 countries. That's up from 45% just five years ago. Bauer, who comes from two generations of leather artisans, has been able to capitalize on family connections in Western Europe (particularly Germany and Austria) for sales leads and distribution partners. "That's where we're from -- where we understand the customers best," said Billy Bauer, 22, Harold's son and marketing director of Royce Leather. Billy added that his father's foreign language skills (he speaks five languages) give him an edge in tapping into markets like France and Russia. Related: I'm a legal immigrant, but not allowed to have a job. Experts agree that immigrant entrepreneurs have a leg up. "Family ties, familiarity with the culture, market, and investment environment in the home country all could facilitate export" said Qingfang Wang, an associate professor of Geography and Public Policy at the University of North Carolina at Charlotte. Wang is quick to note that not all immigrant-owned businesses are able to leverage these ties, however they do have a "much higher propensity for participating in transnational activities." Doug Barry, an author and trade specialist with the U.S. and Foreign Commercial Service, agrees. "Immigrant-owned companies are more likely to export and to be successful in doing so," he said. "Why? One reason is that they just do it. They are comfortable dealing with other cultures." This is true of Priska Diaz, a Peruvian immigrant and founder of New York-based startup BittyLab, which makes innovative baby bottles. She didn't anticipate exporting so early on -- her business is just one year old -- but she didn't shy away from it either. Diaz, who moved to the U.S. at 17, wanted to first build and establish her business in the U.S. market. But due to "unsolicited international demand" for her Bare Air-Free Baby Bottles, she started exporting her products (sold via Amazon) (AMZN) to Canada, the U.K. and Australia. Now, international sales make up 10% of her business, which she plans to grow. Diaz, 39, said her childhood friends (who live around the world) are proving to be a real business asset in finding international distribution partners (she's been contacted by distributors in South Africa, Turkey, and the Middle East). "There's a level of trust that makes it easier to work with my friends," said Diaz. Ben Guez echoes that sentiment. The French entrepreneur launched electronic cigarette company Ophis a year ago in Beverly Hills. He said his European roots help him bridge partnerships abroad. "Our international clients feel confident to talk with two immigrant entrepreneurs," said Guez, who co-founded Ophis with Rudy Halioua, also from France. Still, few U.S. small businesses are exporting their goods and services -- just about 300,000 of some six million. But those that do export anticipate ramping it up over the coming year, according to a survey from Western Union Business Solutions. They surveyed small and medium-sized businesses who engage in international trade. Nearly half said they've grown exports over the past 12 months. Those looking to start exporting or expand their international base can learn from immigrant entrepreneurs. "It's natural for them to go to a foreign country to sit down with people who are not like them," said Barry. "These characteristics are not exclusive to immigrant business owners and can be learned and applied by anyone."